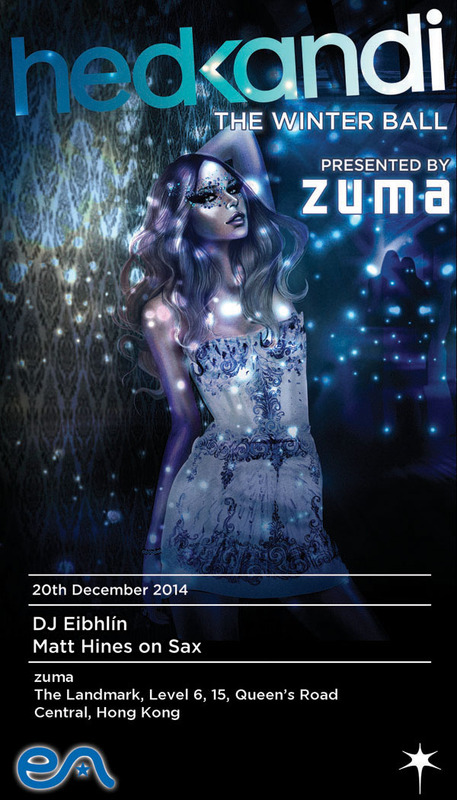 This Christmas, zuma is bringing high-quality house music to Hong Kong with international mega brand Hed Kandi’s DJ Eibhlín Flynn and saxophonist Matt Hines on Saturday 20th December 2014. DJ Eibhlín Flynn's alluring beats combined with Matt Hines's jazzy tunes on the saxophone are something you won’t want to miss, so suit up and put on your most glamorous white dress or smart tuxedo for an unforgettable and extraordinary Winter Ball at zuma. Releasing compilations and singles ever since 1999; Hed Kandi has not only earned its name in being a respected music brand, but more so a globally recognized versatile name for glamorous international sound and broad appeals. What’s a winter ball without masquerade masks? Put your mask on and step inside the extravagant festive ball where you can immerse yourself into the celebratory music and let the glitters lead your way. We may not be dreaming of a white Christmas here in Hong Kong, but a magical night of great music and great fun will certainly make it the most festive event of the year. Early Bird tickets (until 1st December 2014 or when allocation sells out) - HK$200 including 2 standard drinks. Advance tickets - HK$280 including 2 standard drinks. On the door - HK$300 including 2 standard drinks. Late night entry (after 2am) - HK$200 including 1 standard drink. Table Packages starting from HK$6,000 including one bottle of Kettle One vodka (75cl) & one bottle of Krug Champagne (75cl).